You can really grow potatoes anywhere! From large plots of land or raised beds to containers on your patio, you can grow potatoes. 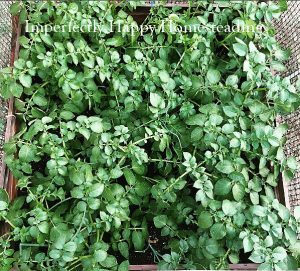 I’m talking about traditional potatoes today but if you want to grow sweet potatoes I do have a post about that as well, read here. Potatoes are a cool weather vegetable, so if you’re in a southern state like me you’re going to want to plant these in the fall and winter; but sure to check your area’s planting schedule. We love potatoes so I plant them in raised beds and have containers of them all over the yard and porch. I tend to grow smaller varieties like red and gold potatoes vs big russet potatoes. So let’s talk about how we can have the best results (aka BIG harvests) with potatoes. You can try planting potatoes that have sprouted from the store but these won’t give you the best success. Most store-bought potatoes are treated to slow or prevent sprouting. If you do go this route you can cut the potato up so that you can plant the parts where the “eye” are sprouting. Your next option is buying seed potatoes which are specifically sold to grow potatoes. They are little potatoes that usually have already sprouted. I highly recommend getting organic seed potatoes. Lastly, you can save your own seed potatoes for the following year. I simply use those last few potatoes that we haven’t eaten and are now sprouting. When you grow potatoes the soil should be light and loose, heavy or compacted soil will result in smaller and/or misshapen tubers. This can be accomplished by amending the soil with good organic compost. Many like to mix in straw or mulch to heavy soils but because my beds are filled with my own mix, I haven’t needed to do that. Where ever you decided to grow potatoes, make sure they get plenty of sunlight. It is also important to use crop rotation each year so that you can prevent many of the pests and disease that can harm potatoes. Trench & Hilling Method – if you’re planting directly into the ground then you’ll want to use the trench method. You’ll want to dig a trench about 5 – 7 inches in depth and place your seed potatoes (eyes/sprouts up) about 10 – 12 inches apart. Cover your seeds with soil or a mix of soils and straw. As the plants grow you’ll want to create a hill or mound around them when the plant reaches 4 inches above the soil. This keeps your tubers covered and not exposed to sunlight. Raised Beds – This is my preferred method for all my vegetables and they work great for potatoes too. I like to use my 12 inch deep beds for potatoes. The best way is to put about 6 inches of soils in and bury the seeds about 3 inches down. If you are a Square Foot Gardening, you can plant 1 seed for every square. You’ll use a similar hilling method on your plants as they grow, until you reach the top of your bed. You will continue to do a bit of mounding above the bed to keep the tubers covered. Pots & Bags – I prefer fabric grow bags or the bags created especially for growing potatoes but you can use large pots as well. I have even seen people grow potatoes in bags of compost or garbage bags. Containers need good drainage because wet soil can cause potatoes to rot. You’ll plant in these much like you do the raised bed and you should be able to get a few seeds in each container depending on its size. I recommend that the containers are 12 inches deep for the best results but I have done them in shorter and had potatoes at the end of the season. As you grow potatoes you’ll realize they are pretty low maintenance. I don’t fertilize my potatoes as I am using rich compost in my soil from the get-go. Do make sure that your tubers are getting at least 1 inch of water each week. You don’t want them to dry out but you definitely don’t want wet soil that will rot your potatoes. Keep them covered. You don’t want potatoes exposed to the sunlight because this will cause green skins – which is not a good idea to eat. Your potatoes will take 3 – 5 months to come to full maturity (see pic of growing cycle above). About two weeks after the plants have flowered you’ll notice they will begin to brown. Once the plants die off you can harvest, but you can leave your tubers in the ground for several weeks longer as long as the soil remains dry. To harvest, I prefer to dig around with my hands, which is harder if you’re planting in the ground as opposed to a raised bed or container. I often dump containers into my wheel barrel to make searching easier. You can also use a digging fork or shovel; the problem with these is that you’ll often damage potatoes in the process of digging. Damaged potatoes are still edible but you won’t be able to store them for long. 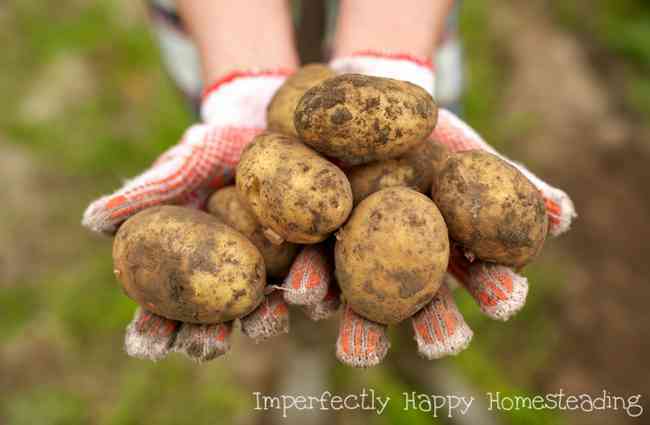 I have written detailed instructions for preparing your spuds for long term storage – read that HERE. You’re going to love to grow potatoes because they are so easy, store well and there are so many varieties to choose from…check out the Purple Majesty. Hello, Tiffany! I love how you wrote this article in simple words which anyone can simply follow and understand. Looking forward to your next blog post!